Racial discrimination refers to the practice of treating individuals differently because of their race or color. Federal law prohibits race discrimination in the workplace and incidents of race discrimination can take many forms, in the workplace particularly, race discrimination can be hard to identify. For more information about race discrimination read below. 1. What is race discrimination? 2. Which federal law covers race discrimination? 4. How does Title VII protect against discrimination? 5. Can I be discriminated against because my spouse and friends are of different races? 6. Can I be discriminated against because of the color of my skin? 7. Can I be discriminated against by someone of the same race as me? 8. Are racial jokes or slurs against the law? 9. What is reverse discrimination and is it covered under Title VII? 10. Can I be assigned to a particular kind of job, or to a certain neighborhood or territory because of my race? 11. Can a job application ask me to identify my race? 12. Can employers use testing or implement a policy that affects one race more than another? 13. Is race ever a qualification for a certain job? 14. What about policies that affect one race more than another, do they constitute discrimination? 15. My company has an affirmative action plan. How can this affect me? 16. What is the difference between race discrimination and racial harassment? 17. What if I don’t have direct evidence of race discrimination, do I lose my case? 18. Who enforces the law? 19. What are the remedies available to me? 20. How can I file a complaint? Racial discrimination occurs when an individual is treated differently based upon their actual or perceived race. Race discrimination also encompasses discrimination based upon skin color. Though race and color are related concepts, the two are not synonymous. Color generally refers to discrimination based upon one’s pigmentation, complexion, or skin shade or tone. Color discrimination occurs when someone is discriminated against based on the lightness, darkness, or other color characteristic. Color discrimination can occur between persons of different races or ethnicities, or between persons of the same race or ethnicity. Regulation that prevents race discrimination also prohibits discrimination based upon stereotypes, assumptions about abilities, traits or the performance of individuals of certain racial groups. Race discrimination can also occur if an individual is treated differently based upon their association with members of another race. Such discrimination can occur directly, such as when an employer intentionally targets a member of a racial group or indirectly, for example when a seemingly neutral job policy tends to exclude minorities for a reason that is not job related. Hiring/Firing/Promotions: You apply for a job for which you have experience and excellent qualifications. You are not hired because some of the company’s long-time clients are not comfortable dealing with African-Americans. You are told that you are being laid off due to company cutbacks and reorganization, while white employees with the same job and with less seniority than you keep their jobs. You have worked for your company for several years, receiving exemplary reviews and an employee-of-the-year award, yet each of the five times you have applied for promotions, the positions you applied for are instead filled by less qualified people of a different race. Pay: You worked your way up from the position of executive assistant to project manager. A white project manager with similar training and work experience was recently hired, and you find out that he will be paid more than you. You are a top salesperson for your company but are moved to a less desirable territory because it is a minority neighborhood, while a white employee with much lower sales is given your territory and client base, enabling him to make much more in commissions than you will make for several years. Job Classification: You work at a company that has an eight-tier job classification system; your responsibilities have increased over time, but your job classification and pay has remained stagnant; white colleagues have their job classification and pay adjusted to reflect their increased responsibilities. Harassment: One of your coworkers thinks it’s “funny” to use the “n word” in conversation and to tell jokes insulting blacks, Latinos, Asians, and other minorities. These comments make you very uncomfortable, and you’ve asked him to stop, but he tells you that you need to get a sense of humor. The boss tells you to ignore him, but doesn’t talk to or discipline your coworker for his harassing behavior. The examples listed above are not an exhaustive list, but do illustrate the general elements of race discrimination. Title VIIof the Civil Rights Act of 1964 is a federal law that protects individuals from discrimination in employment based on race. Title VII makes it illegal for an employer to discriminate against individuals because of their race in hiring, firing, discipline, distribution of benefits, promotion, compensation, job training, or any other term, condition, or privilege of employment.The laws of most states also prohibit discrimination based on race. For more information, see question 16 below. Title VII covers all private employers, state and local governments, and educational institutions that employ 15 or more individuals. Title VII also covers private and public employment agencies, labor organizations, and joint labor management committees controlling apprenticeship and training. Many states also make it illegal to discriminate on the basis of race. For more information, please see our page on the minimum number of employees needed to file a claim under your state law. Anti-discrimination protections apply to job applicants as well as current workers. If you are a current employee and are fired, not promoted, or paid at a lower rate, you are protected under the law. If you are not hired because of your race, you are also protected. Disparate treatment: when individuals are treated differently on purpose because of their race. Examples include offering ethnic minorities lower starting salaries, or posing different interview questions to white applicants and ethnic minorities. Disparate impact: this is a negative impact that race discrimination might have. It happens when seemingly neutral workplace practices have an unnecessary and negative effect on members of a protected class. Examples of this can include unnecessary requirements for one’s appearance, like requiring men to have short hair, which might eliminate qualified Native American applicants, or requiring hair to be straightened, which would unduly burden many African American women who have naturally curly hair. There is a key legal distinction between disparate impact and disparate treatment race discrimination. A case involving disparate treatment requires a finding of intentional discrimination and the individual must prove that the employer had a discriminatory intent or motive. However, disparate impact cases do not require a showing of intent. Attendance or participation in schools, places of worship, or other cultural practices generally associated with certain minority groups. Protected practices or characteristics can include cultural dress, manner or speech, but are only protected as long as the practice or characteristic does not materially interfere with the ability to perform job duties. No. Race discrimination includes discrimination on the basis of shade of skin color. For example, it would be unlawful for an employer to discriminate against dark- or light-skinned African-Americans.Race discrimination includes discrimination on the basis of physical characteristics associated with a particular race, such as hair texture or facial features, this is even though not all members of the same race share the same characteristics and even when the victim and the perpetrator of the discrimination are of the same race. Yes discrimination based on race by someone of the same race is still illegal. There is no requirement under the law that the victim and the perpetrator be of different races. It depends. Racial jokes or slurs may be considered a form of harassment, which courts have determined is a form of discrimination under the law. However, federal law does not prohibit simple teasing, offhand comments, or isolated incidents that are not extremely serious. The conduct must be sufficiently frequent or severe to create a intimidating, hostile, or offensive working environment, or result in a “tangible employment action,” such as hiring, firing, promotion, or demotion. For more information, see our page on racial harassment. Reverse discrimination is a term created to mean discrimination against members of a historically majority, or “advantaged,” group. However, it is not a legal term identified by U.S. courts. Because anti-discrimination laws were enacted to prevent discrimination against groups that were historically disadvantaged and denied opportunities in the workplace, there may be a perception that members of majority groups are not protected by the same laws. However, anti-discrimination laws prohibit all forms of discrimination based on protected characteristics, regardless of whether a person belongs to a majority group. Much of the opposition to affirmative action is based on what are called “reverse discrimination” and “unwarranted preferences.” However, less than 2 percent of the 91,000 employment discrimination cases pending before the Equal Employment Opportunities Commission are reverse discrimination cases. Under the law as written and interpreted by the courts, anyone benefiting from affirmative action must have relevant and valid job or educational qualifications. If your employer has an affirmative action plan, it may help eliminate some of the barriers to advancement that racial minorities have faced historically and perhaps even working for your employer. You may wish to consult with your company’s human resource department or your personnel handbook to learn more about how the plan may benefit you and other employees who are racial minorities. It is against the law to limit, segregate, or classify employees or applicants for employment based on race in any way that could deprive them of employment opportunities or otherwise adversely affect their employment status. It is a violation of Title VII if employees of a certain race or races are segregated by being physically isolated from other employees or from customer contact. Title VII also prohibits assigning primarily minorities to predominantly minority establishments or geographic areas. It is illegal to exclude minorities from certain positions or to group or categorize employees or jobs so that minority workers generally hold certain jobs, or because of a belief that they should do so. Consequently, an assignment or placement selected because of your race that segregates you or negatively affects your pay, status in the company, or ability to advance would be against the law. Yet an assignment made for legitimate nondiscriminatory reasons that do not negatively affect or segregate you would not be illegal. Requesting pre-employment information that discloses or tends to disclose an applicant’s race suggests that race will be unlawfully used as a basis for hiring. It is presumed that when an employer asks for such pre-employment information that it will be used to make hiring decisions. Therefore, if members of minority groups are excluded from employment, asking for such information in the job application process is likely to be evidence of discrimination. However, employers may have a legitimate need for information about their employees’ or applicants’ race for affirmative action purposes and/or to track applicant flow. One way to obtain racial information and guard against discriminatory selection is for employers to use “tear-off sheets” for the identification of an applicant’s race. After the applicant completes the application and the tear-off portion, the employer separates the tear-off sheet from the application and does not use it in the selection process. Not if it is not job-related. Title VII makes illegal both intentional discrimination as well as job policies that appeal neutral but in fact are not job-related and disproportionately harm workers of certain races. An example of an apparently neutral policy with a discriminatory effect might be a policy that requires a high school degree for all employees, which may disproportionately exclude African-Americans and Latinos. If a high school degree is not necessary to perform every position, such as those involving physical labor, then this policy might be illegal. A policy that excludes individuals with sickle cell anemia tends to discriminate against African-American individuals and would be illegal unless proven to have a legitimate business purpose. Yes, in very limited circumstances. Title VII makes an exception when age is an essential part of a particular job – also known by the legal term “bona fide occupational qualification” or BFOQ. For example, if a company hires an actor to play the role of an African-American father, being African-American is a necessary part of the job, or a BFOQ. However, an employer who claims a BFOQ exists for a particular job must be able to prove a person of a certain race is required because a worker’s ability to do the job is actually diminished if he or she is not a member of that race. Discrimination on the basis of a natural physical characteristic associated with race, such as skin color, hair texture, or certain facial features is against the law, even though not all members of the race share the same characteristic.Title VII also makes it illegal to discriminate on the basis of a condition that affects a certain race, or tends to affect a certain race, unless the practice is job-related and necessary for business. As previously mentioned, since sickle cell anemia predominantly occurs among African-Americans, a policy that excludes individuals with sickle cell anemia must be job-related and necessary for business. Similarly, a “no-beard” employment policy may discriminate against African-American men who have a predisposition to pseudofolliculitis barbae (severe shaving bumps) and is illegal unless the policy is job-related and a business necessity. If there are height and weight requirements, they must be necessary for the safe and efficient performance of job-related tasks, because such requirements may exclude or limit women and members of some racial and ethnic groups. An employer, therefore, must show that the requirement is necessary for the safe and efficient performance of job-related tasks. If there is a less restrictive way to accomplish the same goal other than a minimum height requirement, employers are required to use that alternative to avoid liability for discrimination. Affirmative action goals and timetables are targets for equality and a level playing field. Like goals for profits or productivity, they mark and measure progress, but do not carry legal penalties. Quotas are illegal unless they are ordered by the court as a remedy for discrimination. Your company’s affirmative action plan may be voluntary or may be required by law if your company has contracts with federal, state or local governments or has a past history of discrimination. If your employer has an affirmative action plan, it may help eliminate some of the barriers to advancement that racial minorities have faced historically, maybe even working for your employer. You may wish to consult with your company’s human resource department or your personnel handbook to learn more about how the plan may benefit you and other employees who are racial minorities. Racial harassment is a form of race discrimination, and that is a violation of Title VII. Although Title VII does not specifically use the words “racial harassment,” courts have held that racial harassment is race discrimination and thus violates the law. As noted throughout this fact sheet, there are many forms of race discrimination that are not racial harassment, such as discrimination in hiring, firing, promotions or benefits, pay discrimination, and racial stereotyping. You are in a protected class. You are qualified for a job or performing it adequately. You were denied a job benefit, or subject to a negative job action. The person who received the job or benefit was a different race, or the company continued to search for other “qualified” applicants. For example, if you were denied a promotion and you believe it was because you are Mexican, you would have to prove that you qualified for the promotion, didn’t get it, and the person who got it is not Mexican. The Equal Employment Opportunity Commission (EEOC) is the agency of the federal government responsible for investigating charges of job discrimination relating to race discrimination in workplaces of 15 or more employees. Most states have their own agencies that enforce state laws against discrimination. For more information, see question 16 below. other actions that will make an individual “whole” (in the condition she or he would have been in if not the discrimination had never occurred). An employer may be required to post notices to all employees addressing the violations of a specific charge and advising them of their right to be free from discrimination, harassment, and retaliation. If necessary, such notices must be accessible to persons with visual or other disabilities that affect reading. The employer also may be required to take corrective or preventive actions with regard to the person(s) responsible for the discrimination, take steps to minimize the chance it will happen again, as well as stop the specific discriminatory practices in the case. Your state law may allow for greater or different remedies than federal law. For more information, see question 16 below. 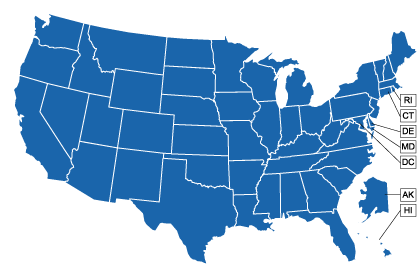 For more information on filing a complaint for race discrimination, select your state from the map or list below.